New! Quicklinks for this book have been updated to include lots of new video clips and activities. Choose a page number to see the recommended websites. For picture puzzles to print out and solve, click on /Spanish/ in the menu at the top of the webpage. Please note, videos and sound clips may have speakers from both Spain and Latin America. Some variations may exist in pronunciation and there may be minor differences between the Spanish words in your book and the recommended websites. Scroll down to find the podcasts and click on "Daily Life in Spain. Click on "Poster -The Spanish speaking world" under "Other resources". 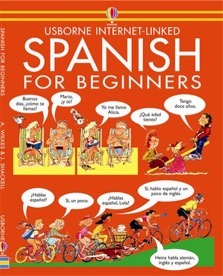 Includes audio examples of Spanish words. Click on a topic, then for a quiz click on "Speaking Challenge" or "Listening Challenge". Also available with audio CD or cassette with recordings of the words and phrases on each double page of the book. Humorous illustrations demonstrate hundreds of everyday phrases with tips on pronunciation and grammar. Arranged by topic from introducing yourself to asking directions and eating out. Ideal for complete beginners and includes internet links to websites with video clips, activities and downloadable puzzles. Also available with an audio CD of recordings of all the words and phrases.